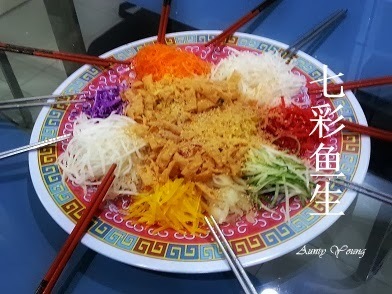 Eating Yee Sang during Chinese New Year is a cultural activity for Chinese living in Singapore and Malaysia. the seventh day of the Chinese New Year. Yee Sang literally means "raw fish" but since "fish (鱼)" is commonly conflated with its homophone "abundance (余)". 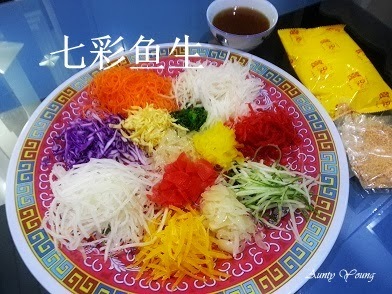 Therefore,Yee Sang is considered a symbol of abundance, prosperity and vigor. we can save time and avoid a fiddly job. Vegetables : Cucumber,carrot radish,purple cabbage,kaffir lime leaves. Sauce : (3tbsp sweet plum sauce, 1tbsp sesame oil, 2tbsp water, 1tbsp maltose syrup.) Melt the maltose syrup with water at low flame,add in sesame oil and sweet plum sauce, mix well,set aside. 1. Clean and julienne all vegetables and fruits,arranged them together with pickle and crispy bite in a circle on a large serving plate. 2. Sprinkle peanuts sesame seeds, five-spices and white pepper,then drizzle sauce over the ingredients. 3. Toss it and enjoy ! 1. Remove the seeds from the cucumber and julienne it. 2. Skin the Asian pear and immerse in salt water before julienne. 3. To prevent a bitter taste, one teaspoon of shredded kaffir lime leaves is enough. 4. The sauce and flavorings can be adjusted to fit your taste. 5. Normally, the Yee Sang is eaten with raw fish slices, but sometimes fresh fish is difficult to obtain, or to make the dish suitable for vegetarian friends, the fish can be omitted. served when I had dinner with my brother on the 3rd day of CNY. Very colourful and impressive. May the year of Horse brings you lots of happiness, prosperity and good health. Thanks Veronica, same to you. May every thing will good as you wish ! i have never thought of making this myself.. frankly, we always go to the restaurant! this is a simple dish but one of those where after you see someone doing it, you slap your head and go.. gosh, why didn't i think of this? thumbs up to you!! It's simply delicious and economical! Give a try , I am sure you will enjoy it. He.........Yan, then give me 5 , hopefully we can "ong" for this horse year! Yer!!!! Where to buy the ready sesame n groundnut? I bought them from one of the Chinese grocery near SS 15 market,Subang Jaya.